A view of ongoing renovations at Nassau Coliseum on Jan. 10, 2017. 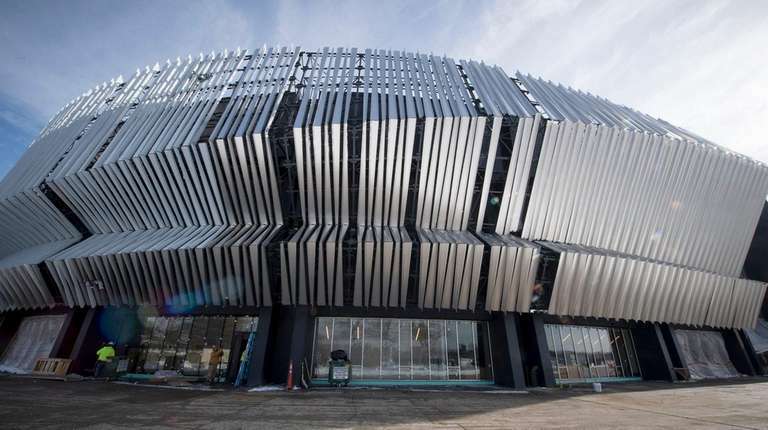 Photo Credit: Newsday / J. Conrad Williams Jr.
Nassau County Executive Edward Mangano said he has met with New York Islanders owner Jonathan Ledecky to discuss the team’s possible return to its former home at Nassau Coliseum. Mangano said he requested the Nov. 17 meeting with Ledecky, who co-owns the team with Scott Malkin, to discuss a path for the team to return to Nassau. Mangano said he also holds regular meetings with Barclays management. Management of the Barclays Center in Brooklyn — where the Islanders have played the past two seasons — also would “cooperate” if the team wanted to opt out of its 25-year license agreement with the arena, according to sources familiar with the conversations. The Islanders and Barclays Center each have the ability to opt out of the agreement in” January 2018. If the Islanders opt out, they can leave after the 2017-18 season or the 2018-19 season. If Barclays Center opts out, the team has to leave after the 2018-19 season. Barclays Center owners are spending $130 million to renovate the Coliseum. The overhauled arena will have capacity for 13,000 fans for hockey games, 13,500 for basketball games and more than 14,500 for concerts. Sources said the Coliseum can retrofitted at any time to add nearly 2,000 more seats for sports. Before its renovation the Coliseum had about 16,000 seats. Barclays is the second-smallest arena in the NHL with a capacity of 15,795, including about 1,500 obstructed-view seats. A Barclays spokeswoman declined to comment Monday. An Islanders spokesman declined to comment. Players have complained about the quality of the ice surface at Barclays Center, which was not designed with hockey in mind. Newsday reported in July that Islanders owners have had discussions about building a new arena either next to Citi Field in Flushing or at Belmont Racetrack in Elmont. Barclays officials are encouraging an Islanders to return to Nassau, in part, to prevent construction of an arena that would be in direct competition for shows and concerts with the renovated Coliseum, sources said. An NHL spokesman declined to comment Monday. Bloomberg reported Monday that a financial document distributed to potential investors in the Barclays indicates that the Barclays Center is preparing for the departure of the Islanders. The document did not list any revenue generated by the Islanders after the 2018-19 season, according to the story. A summary of the license agreement obtained by Newsday shows Barclays Center pays the Islanders an annual fee of $53.5 million. However, that amount can be reduced based a on a number of factors, including operating costs of the arena. The Barclays Center receives all revenue from preseason and regular-season tickets, luxury boxes, concessions, advertising, marketing and radio rights until the total reaches $53.5 million, which the arena fell far short of during the first season. Barclays Center paid the Islanders $37.5 million after the 2015-16 season, the Islanders’ first at the Brooklyn arena, according to a financial disclosure document obtained by Newsday. Nov. 8, 1971: NHL awards expansion franchise to Roy Boe. The Islanders are to begin play in 1972-73 season at Nassau Coliseum. Oct. 7, 1972: Islanders lose their home opener and first game in franchise history, 3-2, to Atlanta Flames. June 10, 1973: Al Arbour named coach. June 17, 1973: Islanders select Denis Potvin with first overall pick in amateur draft. Oct. 27, 1973: Potvin scores his first NHL goal as Islanders defeat Rangers for the first time, 3-2. May 28, 1974: Clark Gillies chosen in first round of the draft, Bryan Trottier taken in second round. June 11, 1974: Potvin wins Calder Memorial Trophy as NHL’s top rookie. April 11, 1975: Islanders win their first playoff series, beating Rangers in three games when J.P. Parise scores 11 seconds into overtime at MSG to give the Isles a 4-3 victory. April 26, 1975: Islanders rally from 0-3 deficit to beat Penguins 4-3 in second round of playoffs. Ed Westfall scores with just over five minutes left in regulation and Glen Resch makes 30 saves in 1-0 victory, which made Isles the second team (Toronto, 1942) to complete such a comeback. May 7, 1975: Having made history by beating the Penguins in seven games after trailing 3-0, the Isles avoid elimination in Game 4 of the semifinal when Jude Drouin scores at 1:53 of OT. The Islanders win twice more, forcing Game 7 and establishing the franchise’s identity. May 12, 1975: In semifinals, Islanders fall behind in series 3-0 to Flyers, but force another Game Seven with a 2-1 win at home on Gerry Hart’s third period goal. May 14, 1975: Westfall presents Philadelphia icon Kate Smith with roses before her performance of “God Bless America,” but Flyers eliminate Isles 4-1 in Game Seven of Stanley Cup semifinals. June 7, 1976: Potvin wins first of three Norris Trophies. Trottier wins Calder Trophy. Feb. 3, 1977: Richie Hansen of Northport becomes first Long Islander to score a goal in 3-2 win over Rangers. April 17, 1977: For third consecutive season, Isles advance to Stanley Cup semifinals when they sweep Sabres. But they lose to Canadiens in the semifinals -- third straight season that they fall to the eventual champions. June 14, 1977: Isles select Mike Bossy in first round of the amateur draft. John Tonelli taken in second round. April 1, 1978: Bossy becomes first rookie in NHL history to score 50 goals in a season, getting No. 50 in a 3-2 win over Capitals. April 8, 1978: Islanders clinch their first Patrick Division and Campbell Conference championships with a 7-2 win over Rangers at Coliseum. July 31, 1978: John Pickett becomes managing general partner, replacing Boe. The Islanders reportedly are on the brink of bankruptcy. Dec. 23, 1978: Trottier scores five goals and three assists against Rangers in 9-4 victory. Feb. 19, 1979: Bossy scores 100th career goal in his 129th game, the fastest 100 goals scored in NHL history. April 8, 1979: Bossy scores 69th goal of the season against the Rangers, the second-highest total in NHL history. The 5win gives the Isles a 51-15-14 record, best in the NHL. May 8, 1979: Rangers eliminate Islanders in classic semifinal, four games to two, with a 2-1 win at MSG. June 11, 1979: Trottier wins the Hart Trophy as league MVP. Oct. 13, 1979: Norman (One Shot) Weidner of East Islip scores first-time SCORE-O at Nassau Coliseum. Nov. 28, 1979: Billy Smith scores goal in 7-4 loss to Rockies becoming first NHL goaltender to do so. April 17, 1980: In 5-4 OT win at Boston in Game Two of second round playoff, Clark Gillies and the Bruins’ Terry O’Reilly fight twice in the first period. Later on, Duane Sutter and Bruins’ Mike Milbury ignite bench-clearing brawl. May 10, 1980: Isles advance to their first Stanley Cup Final, beating Sabres in semifinals four games to two. May 24, 1980: Islanders being chronic underachievers changed forever on that Saturday afternoon, Game 6 of the Stanley Cup Final, when Bobby Nystrom converted John Tonelli’s cross-ice feed at 7:11 of overtime and the Islanders saluted their fans with the most famous trophy in sports. Jan 24, 1981: With two goals in the final 4 minutes, 10 seconds, including one with only 1:19 remaining in a game against the Nordiques, Bossy achieved his goal of becoming the second player in NHL history to score 50 goals in 50 games (matching Maurice Richard of the 1944-45 Canadiens). Feb. 20, 1982: A 3-2 win over Rockies is Isles’ NHL-record 15th consecutive victory. May 16, 1982: Islanders win third Stanley Cup, sweeping Canucks. Bossy wins Conn Smythe Trophy. March 22, 1984: Trottier scores five seconds into the game against Bruins at Boston Garden, tying record for fastest goal to start a game. May 5, 1984: Isles clinch 19th straight playoff series triumph, 4-1 over Canadiens to win Wales Conference Final four games to two. May 19, 1984: The dynasty ends as Oilers beat Isles in five games to win Stanley Cup Final. Dec. 20, 1985: Potvin passes Orr as NHL’s all-time leading scorer among defensemen. June 18, 1986: Terry Simpson takes over as coach. Dec. 7, 1988: Simpson dismissed; Arbour returns as coach. Feb. 26, 1991: Pickett offers the team for sale. Feb. 1, 1992: Potvin’s No. 5 retired. March 3, 1992: Bossy’s No. 22 retired. Feb. 20, 1993: Smith’s No. 31 retired. Aug. 17, 1992: A group of Long Island businessmen acquire managing control of the team from Pickett. Don Maloney replaces Torrey as GM. April 24, 1993: Isles win third consecutive OT game vs. Capitals, 4-3, in Game Four of Patrick Division semifinals on Ray Ferraro’s goal in double overtime. April 28, 1993: Pierre Turgeon suffers a shoulder separation and concussion when blindsided by the Caps’ Dale Hunter after a goal. Hunter is suspended 21 games and becomes public enemy No. 1 at the Coliseum. Still, years later, as owner/ coach of the London Knights he speaks highly of Long Island to one of his players: John Tavares. June 1, 1994: Arbour retires and accepts the position of Vice-President of Hockey Operations. Lorne Henning is named coach. April 1, 1995: Bob Nystrom’s No. 23 retired. June 22, 1995: Isles unveil new uniform with a fisherman’s logo that is worn until end of 1996-97 season. July 5, 1995: Mike Milbury named coach. Oct. 10, 1996: Pickett announces he will sell a “substantial” portion of team to Dallas businessman John Spano. Nov. 26, 1996: Franchise sold to Spano for $165 million, that includes $85 million for cable rights. Dec. 7, 1996: Clark Gillies’ No. 9 is retired. Jan. 22, 1997: Pickett and Spano announce they have completed details on the sale, including the cable rights. Jan. 24, 1997: Rick Bowness named coach. Feb. 24, 1997: NHL approves sale of team to Spano. April 7, 1997: Pickett and Spano close the sale. April 12, 1997: Islanders miss playoffs for third straight season. June 13, 1997: Spano unveils several concepts to redevelop Coliseum property at a cost of $360 million to $460 million. Spano says he has to line up co-investors and reach agreement with Nassau County. June 28, 1997: A lawyer for Pickett asks NHL commissioner Gary Bettman to convene an arbitration proceeding that could result in the team being given back to Pickett because Spano still had not made a $17 million payment as part of the purchase deal. June 30, 1997: NHL bars Spano from running day-to-day operations of the team. July 10, 1997: Spano gives up claim to Islanders. Ownership reverts to Pickett. Feb. 25, 1998: Sale of team to New York Sports Ventures co-chairmen Steven Gluckstern and Howard Milstein completed. March 11, 1998: Mike Milbury replaces Bowness as coach. Jan. 21, 1999: Bill Stewart named coach. April 30, 1999: Butch Goring named coach. April 26, 2000: Computer Associates founder and CEO Charles Wang and CA President and COO Sanjay Kumar purchase the team. June 24, 2000: Isles take goalie Rick DiPietro with first overall in draft. March 4, 2001: Lorne Henning named interim coach. May 23, 2001: Peter Laviolette named coach. Oct. 11, 2001: Laviolette is first NHL coach to open career with four straight road wins. Islanders are 9-0-1-1 in October. Oct. 20, 2001: Trottier’s No. 19 retired. April 6, 2002: Islanders clinch first playoff berth in eight seasons with 5-4 win over Caps. April 24, 2002: The 30-year-old Coliseum rocks in Game 4 of the fiery playoff series with the Maple Leafs, especially when Shawn Bates beats Curtis Joseph on a penalty shot with 2:30 left. Bates inspires the fans, and vice versa. “It was just awesome out there,” he said. April 30, 2002: Islanders lose to Toronto 4-2 in Game 7 of Conference quarterfinals. June 3, 2003: Steve Stirling named coach. Sept. 27, 2004: Wang unveils his Lighthouse Project plan to renovate the Coliseum and develop the surrounding area. Oct. 19, 2005: Rick DiPietro turns away all three Rangers shooters at MSG and Miroslav Satan scores Islanders’ first shootout goal for the franchise’s first shootout win. Jan. 12, 2006: Wang announces that Milbury will become a Senior Vice President for Wang’s sports properties, which includes the Islanders, New York Dragons (AFL), Bridgeport Sound Tigers (AHL) and Islanders Iceworks. Also, Stirling is fired and Brad Shaw named interim coach. June 6, 2006: Ted Nolan named coach. June 8, 2006: Neil Smith named GM. July 18, 2006: Smith is fired, and replaced by Garth Snow. Sept. 13, 2006: Goalie Rick DiPietro signed to 15-year contract. March 5, 2007: DiPietro sets franchise record with 56 saves in 2-1 shootout loss to Rangers at MSG. April 8, 2007: Isles clinch playoff spot with 3-2 win over Devils. November, 2007: Wang’s The Lighthouse Group applies to the Town of Hempstead for the creation of a planned development district. The initial application is rejected on the grounds of missing maps, typos and other issues; the application is resubmitted in February 2008. Nov. 3, 2007: Arbour comes out of retirement for one game (working the bench beside Ted Nolan) because the franchise wants his career total to be a nice round number, and he leads a 3-2 win over the Penguins. More important, the gesture by the Islanders unites generations of fans and players. Captain Bill Guerin says it was like playing for Vince Lombardi. Aug. 12, 2008: Scott Gordon named coach. April 30, 2009: Town of Hempstead calls for revisions to Lighthouse plan. May 1, 2009: Wang, frustrated he can’t get the Coliseum refurbished or replaced, or that the $3.7 billion Lighthouse Project has nott been approved, says he wishes he had never bought the team. June 26, 2009: John Tavares first overall pick in the draft. Nov. 23, 2009: Dwayne Roloson sets team record for saves in an overtime game, 58, in 4-3 victory at Toronto. Nov. 15, 2010: Jack Capuano named coach. Feb. 11, 2011: Isles set team record for penalties (34), penalty minutes (183) and combined penalty minutes (346) in 9-3 win over Penguins. Aug. 1, 2011: Nassau County voters reject proposal to borrow up to $400 million toward a taxpayer-funded new arena. Oct. 24, 2012: Wang announces the Islanders will move to the Barclays Center in Brooklyn in 2015. Aug. 19, 2014: Wang agrees to sell minority stake in the team to Jonathan Ledecky and Scott Malkin, who will gain majority control in two years, pending NHL approval of the deal. Sept. 30, 2014: NHL Board of Governors unanimously approves sale to Ledecky and Malkin.